Boundary Lake: Follow Hwy 3 west from Creston for approximately 26 Km (16 miles) to Maryland Creek Forestry Road and follow it to the lake. The lake provides fly fishing and trolling (no power boats) for Cutthroat to 45 cm (18 inches) and some Dolly Varden and Brook Trout. Bridal Lake: Located on the Salmo Creston Summit (Hwy 3) in Stagleap Provincial Park. Rainbow Trout averaging about 25cm (10 inches). 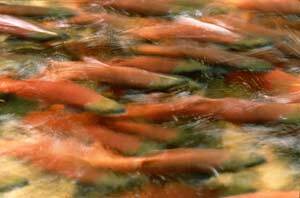 Good evening spin and fly fishing between June 15th and August 15th. Devils Holes: About 26 Km (16 miles) west from Creston on Hwy 3 to Bayonne Creek Forestry Rd. then a 4 Km. (2 ½ mile) hike from the road. Fly and bait fishing for Cutthroat Trout up to.4 Kg (1 Ib). Goat River: About 64km (40 miles) long. Rainbow Trout up to .4kg (1 lb) taken by fly and spinner. Cutthroat Trout up to .4kg (1 lb) taken by fly and barbless hook above the canyon, (See B.C. regulations for closure dates and special angling regulations). Creston -Valley Wildlife- Management --Area: Includes Duck Lake and various sloughs. Bait Fishing and trolling for Large Mouth Bass up to 2.7 Kg (6 Lbs. ), Yellow Perch up to .4 Kg (1 lb.) and Bass up to 4 Kg (10 Lbs.) Duck Lake is an excellent spot for ice fishing in the winter. Kootenay Lake: East of Creston on Hwy 3A Kootenay Lake provides fly fishing bait and grasshopper bait is often good. (See B.C. Regulations guide for info. on special regulations). Kootenay River: About 40 Km (25 miles) long from the border to the south end of Kootenay Lake. Fishing for Ling, Trout and Char. Meadow (Kitchener) Creek: 16 Km (10 miles) long. Located east of Creston it runs adjacent to Hwy 3. Eastern Brook Trout up to .4 Kg (1 lb.) Usually closed Sept-Apr. Check Regulations guide for more info. 'Note': Fish sizes listed are the maximum that have been caught and not the average size. 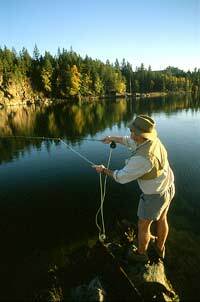 Check the Freshwater Fishing Regulations Guide for details on regulations. If lakes and rivers are not listed in the guide then only the general regulations apply.